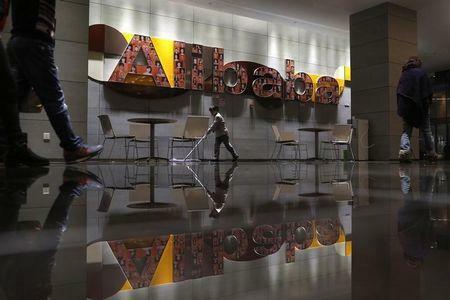 BEIJING (Reuters) - China's Alibaba Group Holding Ltd said on Wednesday it would invest $1 billion into its Aliyun cloud computing arm to challenge Amazon.com Inc's lucrative Web Services division, opening a global front in the battle between the two e-commerce giants. With the global cloud computing market estimated by analysts to be worth about $20 billion, Alibaba said in a statement the investment would go toward setting up new Aliyun data centers in the Middle East, Singapore, Japan and Europe. The firm also plans to strike business partnerships with telecom and enterprise technology providers in those regions. Simon Hu, the president of Aliyun and former head of Alibaba's microfinance arm, said in an interview that Aliyun had focused on the Chinese market in its first six years but has now attained the technological maturity to challenge U.S. cloud players like AWS, Microsoft Corp and IBM Corp .
"Our goal is to overtake Amazon in four years, whether that's in customers, technology, or worldwide scale," Hu said. "Amazon, Microsoft and others have already laid the groundwork for us by educating the markets about cloud in the U.S. and Europe, so we have an even better opportunity to join in the competition." After Amazon made a limited "beta" entry into China last year, where cloud adoption rates by businesses are far lower than in the rest of the world, Aliyun opened a data center in Silicon Valley in March to serve U.S. customers. Although Amazon counts some of the largest companies on the Internet among its 1 million customers, Aliyun says it has amassed 1.4 million customers - amounting to over 20 percent market share in China - largely thanks to the countless Chinese sellers who host their online storefronts with Alibaba. Hu said the partnership would help promote cloud adoption in China, which had considerable room for growth as the government continues its campaign to digitize Chinese industry.